Brewer Description: (from website) Saison Dry Hopping was first brewed in 2010. 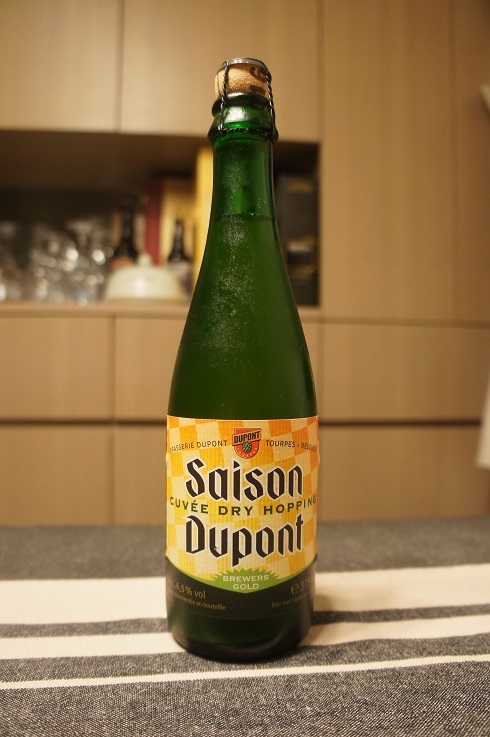 In line with the Dupont tradition, this is a top-fermented blond beer, refermented in the bottle. 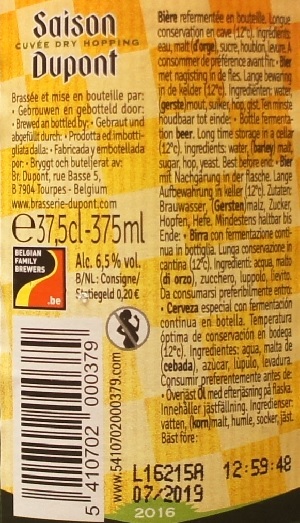 The special feature of this beer, which is produced in limited quantities, is that the hops used for the “dry hopping” are different every year. This year, three distinctive hop varieties were selected. For the dry hopping, brews were made from the “Brewers Gold” variety, grown in Germany. The result is a coppery, blond beer, dry and refreshing with sustained bitterness. The use of Brewers Gold in dry hopping intensifies the fruity notes (mainly white fruits and citrus) and gives the beer a perfume of fresh hops. Our selection of yeasts gives the beer very specific aromas and flavours. The genuine bottle refermentation, which may be extended by a long period in your cellar, produces a complex and highly aromatic beer. Intro: A 375ml corked and caged bottle, 2016 cork with a best before date of July 2019. Poured into a Lost Abbey teku. Appearance: It was a hazy golden orange colour with a two finger white head that dissipated fairly quickly and left nice lacing. Aroma: Sweet juicy mandarin, orange, lemon, grass, yeast and pepper spice. Taste: Follows the aroma closely with citrusy mandarin, orange, lemon, hay, grass, yeast and pepper spice. Starts sweet, ends lightly bitter. Mouthfeel: Dry, light to medium bodied with high carbonation. 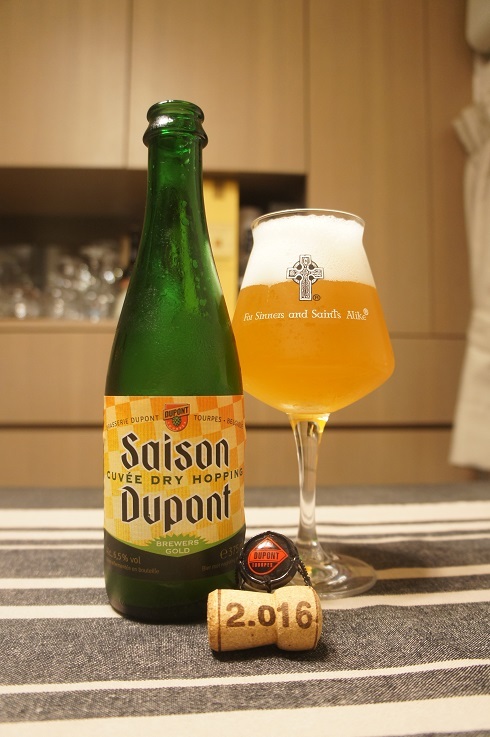 Overall: Another great, easily drinkable Saison from Dupont. 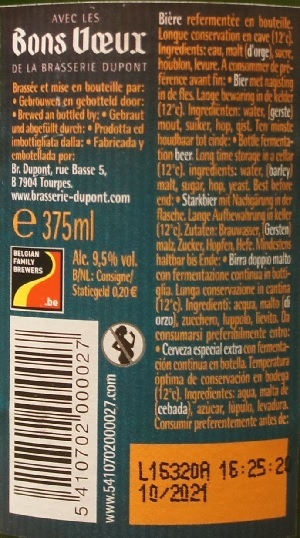 Brewer Description: (from website) The Bons Voeux is a blond top fermentation beer with refermentation in the bottle. Since 1970, the brewery has been brewing a special beer to give as a new years present to their best clients. 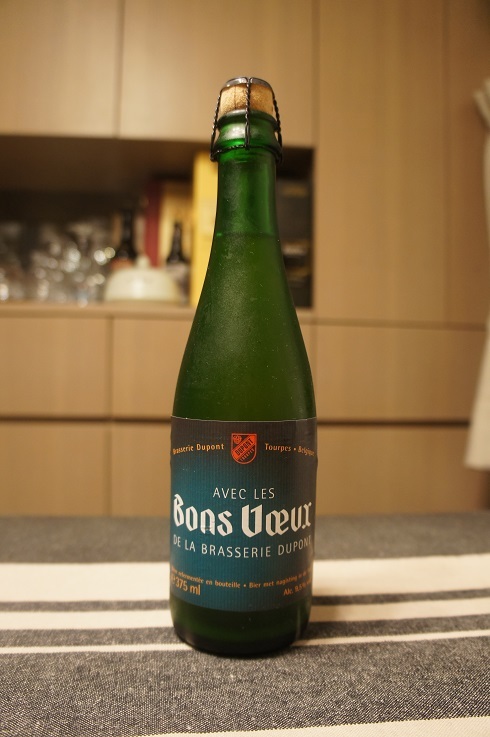 The name of this beer “Avec les bons Voeux de la Brasserie Dupont” means “With the best wishes of the Brewery Dupont.” Because of the increasing success, they started to commercialise this “cadeau” but kept the name. Although the demands were considerable, only a small quantity was brewed, so they had to make a reservation list, even months before new year. 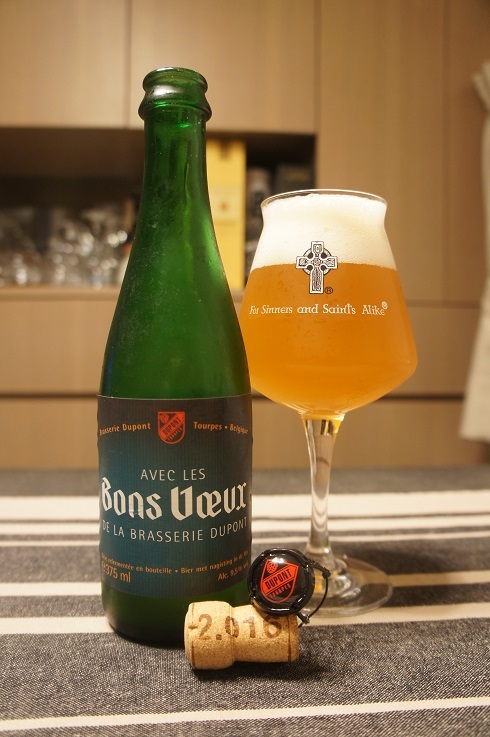 This Bons Voeux is coppery blond, has very fine hop aromas and tastes bitter, fruity and mild. Our selection of yeasts, in combination with a long during riping process, on a “dry hopping” base, are creating a typical and complex aroma and taste. A real refermentation in the bottle, which will continue for a long time in your cellar, result in a harmonious and well-balanced beer, full of unexpected and complex aromas. Intro: A 375ml corked and caged bottle, 2016 cork, with a best before date of October 2021. Poured into a Lost Abbey teku glass. Appearance: It was a hazy golden straw orange colour with a just under two finger white head that had pretty good retention and left nice lacing. Aroma: Peach, honey, lemon, banana and clove with some pepper and herbally notes. Taste: Honey, lemon, banana, clove, grass, pepper spice and yeast. Overall: A very nice cross between a Saison and a Tripel. It’s got the nice classic Belgian beer characteristics and the 9.5% ABV is surprisingly well hidden.